As milestones go, this one’s kind of a biggie. Ten Little Astronauts has reached 100 supporters, which was the target I set for my first book giveaway. One lucky person–revealed in the video above–is getting a signed copy of Robocopout as soon as I have one to send. In terms of funding, Ten Little Astronauts is currently at 22%, so there’s quite a way to go. However, just the sheer number of people who’ve pledged to support it by this point is a huge boost. I’ve seen other books on Unbound published with under 100 supporters. If this were just an ebook, we’d be there already. But it’s not. There’ll be a super high-quality first edition for supporters, with a trade paperback distributed by Penguin Random House. That’s where the other 78% comes in, which will probably mean reaching another 300 or so people, but hey. There are 100 people on board already: there are at least 300 more out there. Catch up with Claire fuller on her website, follow the link to her blog: https://clairefuller.co.uk/ and sign up for her newsletter. Clare’s been busy preparing he launch of her new book Swimming Lessons, interviewing publishing world professionals and has been asked to judge the Jane Austen 200 writing competition. On the 1st October I will be joined by friends and family to celebrate the launch of, *Secrets of the Snow Globe – Vanishing Voices. * I look forward to a fun-filled afternoon with children’s activities, a short presentation and coffee and cake! Also at the event, it is my pleasure to be able to support the local children’s charity, ‘Smile’. I look forward to meeting a representative from the charity and to welcoming our special guests, The Mayor and Mayoress of Eastleigh. Anne’s celebrations will be by invitation only! Damon is also a regular member of the HWS Critique Group. Claire Fuller’s book Our Endless Numbered Days has been chosen for the Richard and Judy Book Club and Waterstones Book Club. Claire Fuller’s book in the window of WH Smith in Fareham. HWS Member Claire Fuller has won the prestigious Desmond Elliott Prize for her début novel ‘Our Endless Numbered Days’. April 2014 – HWS Member, Dai Henley wins Silver Medal! Dai Henley’s book Blazing Obsession has won the silver medal in the adult fiction category of the 2014 Wishing Shelf Independent Book Awards. The book has received some excellent reviews. Dai is now working on the sequel. April 2014 – HWS member – Claire Fuller is Longlisted for Desmond Elliott Prize! Claire’s novel, Our Endless Numbered Days published by Fig Tree/ Penguin, is one of ten debut novels longlisted for the prestigious Desmond Elliott Prize. This annual competition awarded to a first novel has been running since 2008, with Eimear McBride’s, A Girl is a Half Formed Thing winning last year. The shortlist will be announced on 15th May, with the winner revealed on 1st July. A great success for HWS Member Claire Fuller whose book ‘Our Endless Numbered Days’ was launched in February 2015. We wish you all the best Claire, well done. Amazon Kindle have the book on their Countdown deals for 99p until midnight Saturday 18th October 2014. He is also planning to offer his book, The Canterbury Tales the following week. Here in one book are all three volumes of Richard Cuddington’s Easy Reading Shakespeare. This series offers an enjoyable and effortless way of gaining an understanding of The Complete Works of Shakespeare – all 39 plays! Whether you are new to Shakespeare, a general reader, theatre goer or a teacher seeking to stimulate an initial interest in the Bard with your students, you will find here a fun introduction to the genius of Shakespeare. Written in rhythmic narrative verse Easy Reading Shakespeare is a simple and engaging read which makes the plots and major characters of each play instantly accessible, acting as a bridge to the actual texts. Congratulations to HWS member Honey Stavonhagen! Her first manuscript ‘Hope Grayling – the blind detective’ has been shortlisted for the Commonword Diversity Writing for Children Prize 2014. Claire has recently won the BBC Opening Lines Short Story competition, which means that her short story ‘Baker, Emily and Me’ will be broadcast on Radio 4 on 29th August at 3.45pm. The recording will be available to listen to on the Radio 4 website for a week afterwards, and after that it will be available to read online. The story was read by actor Lizzy Watts, and this is a picture that Claire took of her during the recording at Broadcasting House. It is wonderful that so many of our members are doing so well. We wish Claire the very best, and you will have a chance to meet her on 10th March 2015 when at our Members’ Spot, she will be talking about her success. Born in Henley-on-Thames during Royal Regatta weekend, Sharon’s life started with stimulating events. She moved to France at the age of four and didn’t start school until returning to Oxfordshire at six. She broke in wild ponies at twelve, learnt to fly at eighteen but always yearned to write. Her dream became reality in 2014 with the publication of Friday Night’s Dream: Wyckerton. It is a good versus evil story. Forced to move home due to his father’s work, Alfie, a lonely inquisitive boy, soon flourishes in the new city but endures old adversaries, foils murder plots and discovers that, along with the other residents of Wyckerton, he is magic. I wanted children – and adults – to be captivated by the charmed city of Wyckerton, but it was important that the book included uncertain life hurdles like starting secondary school. I love to read detective novels and wanted to bring in touches of Colin Dexter’s Morse and Arthur Conan Doyle’s Holmes, while still packing it full of magic. The story took on a life of its own as Alfie puts himself and his friends in danger, cheats death, fights evil and learns about responsibility, loyalty and true friendship. It even includes a moral. See the 5* reviews and ‘look inside’ at the first chapter on Amazon. Book two ‘FND: The Transfer Vial’ will be available in the Spring of 2015. 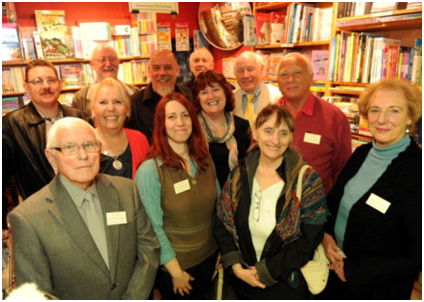 Thank you so much to everyone who came along to World Book Night 2014, it was such a great evening. It was my first signing event and I would like to thank all my friends and family for making it such a wonderful occasion. I would also like to thank Rick, the owner of the amazing bookshop at Lee-on-the-Solent, for organising the event. The event was covered by Portsmouth News. Gary Troia is the author of four short story and memoir books: Spanish Yarns and Beyond; A Bricklayer’s Tales; English Yarns and Beyond and The Complete Short Stories of Gary Troia. He started writing stories based on his own life as a disillusioned bricklayer. He is a South-East London boy from one of the toughest schools in London. An unhappy childhood. Teenage years spent drinking and taking any drug he could lay his hands on. Bricklaying. Finally leading to him being deported from America on drugs charges. He then put himself through university where he gained a degree in philosophy and Spanish, becoming a lecturer, wrote online articles, then taking a leap of faith and becoming an Amazon number 1 bestselling author. For the first time ever, this collection of short stories by Gary Troia brings together, in chronological order stories and memoirs from Spanish Yarns and Beyond, English Yarns and Beyond and A Bricklayer’s Tales into one complete volume. Few have brought this world to life with such despair, black humour and indifference as Gary Troia. He paints a beautifully sad portrait of a truly messed up person with potential, struggling to keep his messed up mind from drowning in cheap wine and self-loathing. Ray’s spirit is trapped in a world of endless grey mundanity. The ultimate “I hate this job” story, written as a collection of short stories and memoirs, each one revealing a snapshot in the life of Ray. Troia captures the tedium of working in a low paid, menial job and living hand to mouth. This book of short stories is sad and questions the reader to ask questions about their own life. This book achieves clarity without trying. The Cuckoo’s Egg. Boyhood antics lead to tragedy. Pointing a House in Islington. Too much alcohol and cocaine don’t mix well on building sites! A Week in the Life of Ray Dennis. With the prospect of no money for food or alcohol this Christmas, Ray has to find work quickly.Catania. A meeting with a Sicilian fox, some Neapolitans, and a man with a camel haired coat. Spain Reborn. No more commuting to London. Let’s celebrate! Three Common Carp. An epic battle with a whale and marlin it is not. The Unchangeable Chameleon. Can a leopard change its spots?